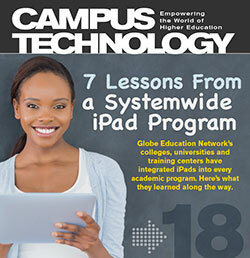 Globe Education Network's colleges, universities and training centers have integrated iPads into every academic program. Here's what they learned along the way. Southern Illinois U's CIO believes the benefits of student labor outweigh the risks. How can IT position itself to support the Internet of Things, 3D printing, wearables and the like? One university aims to improve retention with daily support messages sent to students' mobile devices. Wayne State U is rolling out a homegrown portal focused on real-time, two-way communication. Campus Technology 2014 hosted a dialogue on data, change, MOOCs, innovation and more. Login / Innovation Requires a Little "Crazy"